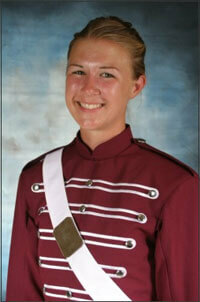 Name, age, hometown: Becka Moeller, 20, Ann Arbor, Mich. What corps are you in and what is your role this summer? This is my second season in the Cadets' pit. Where I go to school and what I'm studying: I am an education major at Eastern Michigan University. Give us your full drum corps/marching music background: I started in marching band when I was 11 and did that for six years, spent two seasons with my high school's winter line, came to Eastside Fury in 2003 (then PIO, currently PIW) and have been there for four seasons now. Then there was Bandettes, Americanos, Crossmen, Kiwanis Kavaliers and the Cadets from 2001-2005, respectively. I'll be aging out in 2007. What does your ideal free day consist of? Sleep in a little bit, have a big breakfast, put on civilian clothing and get bussed to a tourist attraction. With a little luck, there will be a few other corps there enjoying themselves as well. With a lot of luck, almost every corps will be there (San Antonio on the Sunday following the major event in 2005). It's so nice to have friends in other groups and to hang with them on free days. Great random memory: It's 2 a.m. and the entire bus is asleep. I'm half awake because the guy behind me is talking in his sleep. Out of nowhere, he sits up and grabs at the person across the isle's face! So Brad freaks out at being woken up by some kid sleep-grabbing and I'm sitting there laughing hysterically. Favorite tour meal: At Bandettes, I loved eating Kraft dinner, but this summer, I think my favorite would have to be pasta with breaded chicken and marinara sauce and cheese (in a five-gallon tub) and cake/pudding/strawberries/whipped cream all mixed together (also in a five-gallon tub). All of that washed down with icy cold water. In the shower you can hear me singing: Tenacious D The last good book I read: "Choke" by Chuck Palahniuk (author of "Fight Club") The last great film I saw: Every corps must have at least one copy of "Waiting" to watch on the bus. Jobs I have/have had: I worked at a theater for five years, and now I teach high school bands. 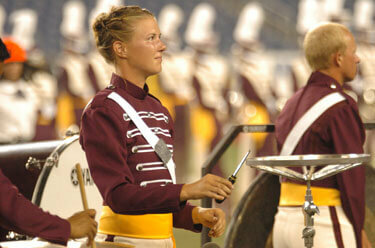 My favorite TV show: "The Price is Right" What has been your formative drum corps moment? I was in the Bandettes and my brother was getting married on the day of DCI Finals, so I knew I would completely miss out on seeing some of my favorite corps in 2001. I was pretty bummed. I looked at our schedule and noticed that the Cadets would be at a show (Pittsburgh) and was super excited because that would be my only chance to see them. As I sat in the stands and watched them perform, I absolutely got chills and realized that that was exactly what I was going to do some day. What advice would you give to young people who want to march? If you don't make the cut one place, don't give up! Also, never forget about Division II & III. Some of my best memories come from time spent there. I know I'm not the only one. What I want to be when I "grow up": A raging success! Favorite drum corps personality and why: Michael Cesario. Need I say more? What would be in your ideal care package? Anything. I love getting mail on tour, but magazines, gummy worms, and new bikini tops are always fun. Best drum corps show ever and why: I really enjoyed Phantom 2003, Bluecoats 2002, and Colts 2001 (I think it could have been 2002, but remembering things isn't my strong suit.). The year is 2030. What does a DCI show look like? Probably more like winter line shows. More costuming, and stuff like that.